The 2016 Cross Country season officially began in mid-June, and as a kick-off event we hosted a guest speaker, Donn Behnke, the former head coach of Wisconsin Stevens Points High School and author of the recent book “The Animal Keepers.” The idea for brining Behnke in to Illinois to speak to high school cross country athletes originated with Paul Vandersteen, the wise and genial coach of Neuqua Valley. Paul knew that I had enjoyed Behnke’s book because I’d posted a note on social media about it, and on that basis, he asked if we wanted to coordinate the event with him. This was long before the results of today’s meet were known to anyone, and though Neuqua appeared to have many good returning runners, we’d had, at that point, no inclination of the immense success they would come to enjoy, capped off by this afternoon’s state title, their third since 2007. The theme of Behnke’s book, though, is not about winning (not really) but rather about the power of team, the virtue of inclusion, and sport as an ennobling pursuit. It’s a story about a misfit kid from a group home who came out for the team, how he defied his coach and teammates’ expectations by being a fearsome competitor, and about how they, in turn, rallied to provide the network of support and care that he’d been deprived of in his life to that point. One year ago, as we headed to state, my wife Megan was 8.5 months pregnant. This year, as I left the house on Friday morning, I kissed goodbye to her and our 11.5 month old daughter Clio. Like the season Behnke documented in his book, this was my first as a parent. And like him, I felt the transition from being viewed by the boys I coached as a cooler older sibling to being viewed more as an authority figure – by turns disciplinarian and compassionate. This season was not an easy one, but, now that the results are known, it is one of which we can be proud. What made this year more difficult than the last few was that, after three years of legitimately being in the trophy hunt, this year we learned through some particularly difficult lessons that earning top three in state was not going to be a very realistic goal. And, in truth, it was harder to stay motivated and to face the challenge of weeks of rigorous training in face of the knowledge that a trip upon the podium was not likely to be our reward. As a consequence, our team struggled to find our footing early on. Though our finishing places were toward the top at all meets we ran, the truth was that throughout the regular season, we did not have a single meet where we felt we’d run the best we were capable of on the varsity level. What ultimately got us back on track was changing our focus from outward to inward. As we approached state, we had a new and more meaningful goal: to run in a way that left us with no regrets. No mention was made of place goals in our team meetings Friday Night and Saturday morning. We focused instead on the process, one aspect of which was to appreciate the opportunity to run in the state championships at beautiful Detweiller Park, a place heaving with the weight of history. Detweiller Park’s golden hued trees are an integral part of the state cross country experience. Those leaves, Autumn’s emblem, call to mind the inevitable passage of time. Our current top 7 were once freshmen and sophomores who came down to watch the state meet on the team fan bus. Several of the current freshmen and sophomores came down this year, and a few of them will, in a year or two, be the new top 7. The first year we qualified as a team during my coaching tenure, 2008, I was dating Megan but not yet engaged. Now we are married and parents. The first year I ran in the state meet was twenty years ago, in 1996. My coach, Mr. Newton, was than 67 years old. Now he is 87 and tomorrow I will attend his retirement celebration at York High School in Elmhurst. The Cubs just won the world series. The world turns. A new era is upon us. Of Mr. Newton, let it be said, that no man ever did more for the sport of Cross Country in the state of Illinois, let alone the nation. That the Illinois State Meet has become the festive, electric, and competitive event it now is would never have been possible without him. His success as a coach will, of course, be unmatched, but the success of our state is also to his eternal credit. When I ran in my first state meet two decades ago, our team finished 5th, and we left the course hanging our heads, believing that we’d let down our coach and the legions of York runners who’d come before us. Shockingly, 5th was at that point the worst York finish in 27 years. If there is one way I depart from my old coach, it is in thinking it unfair to measure each new team I coach against all those that came before. The only appropriate measure can be whether each group of kids became the best they, collectively and individually, could be. So, 20 years ago, the team I ran on finished 5th and felt despondent, while today, the team I coach for finished 6th, and I feel proud, at peace with the reality that the boys I coach earned an end result that represents pretty damn near close the best finish of which we were capable. I am proud of Blake Evertsen, who mustered every reserve he had to finish 19th in state. I know his aspirations were higher, that he finished 4th a year ago. But I saw him with 300 to go and it was clear his tank was empty. I feared he would fade into the 30s or 40s, or jog in having seen his dream of a top finish elude his grasp. Instead, he fought on. In the end, that helped our team immensely, as the gap between 6th and 7th place was a mere 2 points. He is the best runner I’ve ever coached. Hell, in the first race of our season he outkicked Soren Knudsen, who today become the state champion with a blistering time of 14:02. He is headed to Harvard next year, so it is safe to say his future is bright. I hope he will take pride in his performance today and in his preparation this season. I am proud of Sean O’Connell, who suffered through some very rough races in the early part of our season, but finished today as our second man in a personal best time of 15:10. He will be a leader of our team next season, and I have total confidence in his ability to rise to that challenge. Sean is tough, savvy, cerebral, and witty. He is a super talented athlete and I still don’t know how we managed to be so lucky as to win him over from the baseball team, but I am grateful every day that he committed to us. I am proud of Sam Fathizadeh, who probably had the most frustrating season of any member of the top 7, but who showed up today when it counted the most and finished as our 3rd man. After Sectionals, we faced a very difficult decision about who would be on our top 7, and gave serious consideration to appointing Sam as our first alternate. We ultimately decided to place our faith in him knowing he’d had a year of experience running at state and that his workouts had been strong. Today, Sam vindicated that decision and changed the tenor of his entire season in a single race. The stress fracture, bad races, and twisted ankles are all now in the past, road blocks overcome by a kid who never gave up. I am proud of Ryan Doorhy, who crashed and burned in his first two meets of the season before we discovered that he was anemic, with Ferritin levels of 10 (less than 30 is considered unhealthy). It’s been a long road back for this gritty senior. My last observation point during the race was near the tall pine trees which mark the spot where 300 meters remains in the race. Of everyone in our top 7, no one today was kicking harder here than Ryan. He likely passed 20 athletes in the final stretch. That will be my last cross country memory of him, summoning his strength to kick furiously. I am proud of Jan Erik Naess, who finally decided to go ‘all in’ to Cross Country this season and finished as our all important 5th man. As anyone on our team can attest, no one on our team smiles more than him (for our annual mock awards ceremony, he was presented with maple syrup to honor his Canadian heritage and toothpaste to honor his infectious grin), and his positive attitude was a good ingredient to add to our mix this season. I am proud of Ethan Planson, who took a risk today by trying to be all-state – it cost him, but he dared to go there, which few too many athletes do. Ethan was our 6th man – the 4th best 6th man in state. He has trained hard for a long time, even when there were times when it was not coming easily to him. Running is a joy for some, a chore for others. For Ethan, I suspect, it is a bit of both, but his allegiance to his teammates is his most important value, and for them he gave his all. We are all richer for that sacrifice. I am proud of Neil Cumblerland, who, I know, did not have the race he wanted today, but who earned valuable experience which we will count on next season. Neil is studious, methodical, and responsible (an eagle scout! ), all virtues common to great distance runners. He finished the entire season without injury, which in itself was a significant achievement and which has allowed him to build a foundation for future success, which I know he will have. I am proud of Ben Schnieders, Jacob Belgrad, Sam Schiavitti, Colin Yandel, and Alec Hill. These five composed the remaining members of the top 12 we were able to admit to the state series. To earn that distinction was a challenging task on a team as deep as ours. I only wish seniors Ben and Jacob had gotten a chance to run at state. On well over half of the teams that made state, they’d have been in the top 7. Those two did every bit as much work as our top 7, and are every bit as tough. I will miss them both dearly next year. As for Sam, Colin, and Alec, the talk about next year has already happened. It’s been inspiring to watch our neighbors at DGN make a huge jump in one year (from 18th to 2nd). These three boys will form a core along with Sean, Neil, and many others as we attempt to follow suit. I am proud of all the HCXC runners who showed themselves to be teammates in the truest sense by making the long journey down to Peoria to watch us today. This includes (by memory) freshmen Carter McCarroll, Mason Steere, Magnus Naess, Jack Kinsey, and Lincoln Virant, Sophomores Matt Kusak, Keegan Caveney, Brandon Belgrad, Charlie Carter, Fletcher Spillers, Anshul Sankaran, Liam Walsh, James Giltner, and Bradley Davis, Juniors John Wheeler, Liam Bots, Jack Borys, Alex Choi, Joe Glasby, and Steven Zaher and seniors John Bynan, Michael Chadwell, Nicky Midlash, Joe Miscimarra, and Emmett Grundberg (who earns special recognition for being true to his word of supporting the team even after making the painful decision not to come out his senior year). And I am proud (always proud) of our alumni. Thanks to TJ Caveney, Matt Tobia, Sean O’Flaherty, and Billy Fayette for your support today. All the guys I mentioned in the previous paragraph will eventually join your ranks. It is such a privilege to have coached you guys, such an honor to be able to continue to coach your younger brothers, be they literal (in TJ’s case) or metaphorical. On Tuesday, we’ll have an election, and the third of three months-long narratives will be resolved (baseball and cross country being the other two). In this time of maximum national division, let us reflect on the power of cross country to bring us together, bound by our common quest of becoming the best we can be. Your presence has affected the beginning of my running career. Whether it was a friendly “hello” in the hallway, or a quick word of encouragement before, during, or after a race you guys have made me want to commit to the HCXC program. You guys are the hard working, competitive, committed runners that I would like to be in another 3 years. Run hard, run confident and compete. Go Devils. You guys are the greatest around. Just being on the same team as you guys, us younger guys have learned so much about the demeanor, dedication, and pain it takes to have success in this sport. We see day in and day out the sacrifices you guys make for the sport, and the toughness you guys show in races. You guys are also largely responsible for the unity in this team. You guys genuinely care for each and all of your fellow teammates, from freshman to senior, and slowest to fastest. You guys are tremendous role models for me and the rest of the freshman and I’d sincerely like to thank you for that. Best of luck down in Peoria! You guys definitely deserve all the success! By watching you guys run this year, I have seen what a great team really looks like. Our freshmen team has a long way to go before we are ready to ride that bus up to Peoria, but you guys have shown us what a hard working cross country team can accomplish. We wish you the best of luck and go Devils! As state rolls by, I would like to wish you all good luck. You varsity guys are my inspiration as you fight for our school and try your best. I strive to be just like each and every one of you. For that, thank you. Keep on fighting and do your best at state!!! This state meet is something I am aspiring to attend within the following three years, and clearly you guys have earned it this time. Thanks to all of you, I’ve made the decision to dedicate my time and effort into cross country, just as you have done throughout your high school careers. This is your last cross country meet for those of you seniors, so run this out as hard as you can for the Red Devils, you guys are perfectly capable of running your absolute best for this meet, you’ve worked up to this moment and all of you are ready. Thanks for inspiring all of us to work hard as you guys have done, we really appreciate it. More appropriately, my upperclassmen, role models, and inspiration for running. I can still remember clearer than ever, the day back in 6th grade when Ryan Doorhy ran from his house to come visit us at our Westview ‘summer camp’. Even back then, I was completely motivated and utterly amazed at the passion and love that he had amounted for this sport. And so, four years ago, before most of you reading this even heard my name, all of you were unknowingly carrying my dreams and passions of running on your back. You guys, who have dedicated yourself to this grueling sport, giving in hours and hours of training to reach the pinnacle of competition that all of you will face at Detweiller. You guys, who are the reason I can say with both confidence and pride, that I am part of the Hinsdale Central Cross Country program. I wish you all the best of luck down in Peoria, and I have no doubt that all of you will perform at the peak of your abilities during the race. As Coach Lawrence would say, MATCH UP! And go Devils! Watching the effort you guys put in has truly made me the runner I am today. Since the summer after seventh grade, I have watched you put in the effort daily into this sport. Just you guys being there for the rest of the team, saying “hello” in the hallway, or telling us we can do it, and encouraging us in the race, you are the ones that made me commit to running. All of you put the effort day in and day out to the sport and this program. Run hard, and leave everything out there. You are the most committed runners I have seen and I know you guys can do it. Go Hinsdale Central. I’ll keep it brief because I know this packet is thick. June 13th – November 5th. You guys have put in 145 days of grueling work for tomorrow. Keep your emotions in check and just try and enjoy every moment of your trip. Especially Basta. Gotta love Basta. As for the race you know what to expect and you’re all prepared for it. You’ve gotten out quickly all season long and have done plenty of workouts to mimic the start. Go get em’ men. Turn some corners, turn some heads. Thank you. Thank you for representing Hinsdale Central so well over the past several months. The miles you have trained and the miles you have raced have given me an opportunity for pride in my school. I’m sure you all watched the historic Game 7 that ended the Cubs 108-year drought. Most of you, I assume, were excited, barring Doorhy. My favorite quotes from the episode were Anthony Rizzo’s pregame “There’s no tomorrow after tomorrow,” and Dexter Fowler’s postgame “I feel like we played a whole season in one game.” Those two short quotes contain a preponderance of wisdom. When it comes down to the final moment, you have an amazing opportunity to race one last time. An opportunity to show the state the work you’ve put in on the grandest of stages. And then, after it’s over, the season will be finished and that one race will have felt like a lifetime. Both the Cubs and the Indians may be satisfied in knowing they gave their whole effort to a season’s worth of baseball in one Game 7. That is the ultimate success. To look back and know you held nothing back at the critical moment. And in that way, the most important way, both the Cubs and the Indians are ultimately successful. My only hope is that you may find the same success in Peoria. Lastly, I’d like to remind you that this team has so many reasons to be proud of what it’s accomplished already. You have inspired me to be the best runner I can be, and I am indebted to you for that. Looking back at my high school running experience, I have one piece of advice to share: Remember why you run. I’m not talking about “running for your brothers” or “racing to win” or “become better, faster, stronger.” I’m talking about why did you, that very first day after the bell rang, walk into the Health Room and go for a run. I didn’t join HCXC to win a championship or because I wanted to become the fastest, I joined because I liked to run. It turned out, there was a place at Central for people like me. Over time, I discovered that the hard work that being on a championship-caliber team entailed was less palatable, and I certainly trained and raced for the reasons above, but at the end of the day, I just loved lacing up my shoes on a beautiful fall day and hearing the leaves crunch under my feet. For some of you, the past three and a half years together have been filled with laughs and memories, and you will cherish those moments forever. They’ve been made with your teammates sharing something you love. On Saturday, you and those same teammates will be set up behind a bold, white line separating two hundred cross country athletes from three miles of hell. Those three miles will not be easy, and you’ll need the strength of your training and your brothers to conquer it. But, just before the gun goes off, take a step back and take in the moment. You’re doing what you love on the biggest stage of your high school career. What could be better than that? Congrats on taking care of business! You have battled hard this year throughout the ups and downs of the season whilst gaining the needed traction for State. But now, it’s time to seize the opportunity you’ve earned. Take the Peoria experience in, but don’t let it slip away. It’ll go by quicker than you can imagine. Believe in yourself, trust your coaches, trust your teammates, trust yourself! Fight, fight, fight. Run smart, run hard, and you’ll find the good luck HCXC. Keep it Simple Red Devils! Run Free. Gents, trust your training, you have more in the tank than you think! You have great coaches: listen to them and you’ll have a great State! Go out fast. A fast doesn’t guarantee a great race but a slow start will doom your chances. Stay in the race. It is over before you know it. Before and after the race sit down and take a few minutes to take in the whole experience and realize what great things you have accomplished. Congratulations on reaching the State Meet. Good luck. I look forward to seeing the results and I look forward to great things from all of you next week and in the future. It seems only yesterday we were writing our first letters to the XC team competing that first Saturday in November…but that was 2012! Although Matt is now a sophomore at GA Tech and we are living in NYC, we still check the results for HCXC and follow along! Congratulations to all of you! As you make the trip to Peoria, enjoy every minute! Remember all the days, the laughs, and the pain that got you here. Some of you this is your senior year and for some the first trip. Remember as you get to the line those that came before and those that will come after. You are part of an awesome legacy! Take a deep breath and run for your teammates, run for your coaches and run for yourself! Leave nothing back. This is what you’ve worked so hard for. And know that near and far you will have people cheering on the men in red and white!! WOW! You men have done an outstanding job this year of running well, increasing your best times, meeting your personal and team goals, and maintaining the proud and long standing tradition of Central Red Devil Cross Country dominance. Stand Tall, Men! In years to come, you WILL reflect back on this 2016 State meet and say, “I did my best”; “I gave it my all”, “I have no regrets”, or “I could have done better”. What will it be? The choice is yours. All of your school-mates, friends, family, and coaches are praying cheering for you. Run hard and Run smart and you will have done your best. First and foremost, I am so very proud of you all. I know how much time, effort, blood, sweat and tears goes in to all the training you do to get to this level. No matter how dedicated you are, it’s not always fun, and I applaud you pushing through the difficult days and times to stick with the program and dedicate yourselves to being the finest runners you can be, regardless of whether that puts you first, 10th, or 25th in the state! I know the weight of the expectations on your shoulders because of the quality of this program and the legacy of all the runners before you, and having to balance all that Hinsdale Central asks of you. It’s quite a bit to handle, but you do it! I wish you could know how often you are thought about, each one of you! We now have a college runner, who grew to love this sport and the camaraderie and friendships that this sport gives through all those miles run around this community – it has been the single most rewarding aspect of his life! The love of sport and the pride of fair competition is what he learned here, and what he still loves because of HCXC. The discipline and values that you have learned will stand you in great stead for the rest of the years of your lives. To be at state is the thrill of a lifetime – these chances don’t come around very often in life, so above all, appreciate being ALIVE and ABLE to give it your all on this amazing course! You will have great stories to tell about it, and even better memories. We are truly all behind you, every stride that you take! Good luck men – we are so proud! Do your BEST and never give up! Over the years, we’ve watched our 3 sons and daughter compete in sports such as soccer, baseball, tennis, basketball. While we’ve enjoyed watching them all, after watching you boys train and compete, we can say without doubt that the most disciplined, dedicated and impressive athletes are cross country runners. You’ve run in the dark, in the rain, in the snow and in freezing temps without as much as a week off…and tomorrow you will have your moment to run the race of your life. We are all cheering you on from Hinsdale!! All the best as you head to the State Meet in Peoria! What an exciting place to run…enjoy every minute! We have watched you train and compete since you were freshmen and know that you are ready to take on the rest of the state. Give it all you’ve got, listen to your amazing coaches and trust in each other. You have the support of all the former HCXC teams and families who will be cheering for you every step of the way. Go for it! Run fast, be brave and GO RED DEVILS!!! Wear the white proud!! Push down the jitters and run like the wind is at your back. Have gratitude for being healthy, young and able to move at the speed of light! Last year at state did not end the way that you wanted. This year you have a chance to change the ending and leave Detweiller with smiles on your faces. I cannot wait to see Blake way up front and then a swarm of Devils to follow!! Picture us calling out your name and cheering for you every step of the way as you ascend, make your turns, move up the pack and sprint to the finish!! What a huge accomplishment and honor it is to represent Hinsdale Central at State. You have all worked so hard this summer and all season and deserve the chance to go to Peoria and show everyone what your team is made of. To those running, the Hill Family wishes you each the race of your life on Saturday. To the alternates, be proud, enjoy the experience and be ready if your team needs you. To the coaches, thank you for your leadership and passion and for helping these young men get to this place. We will be rooting for you all the way – Go Red Devils! Run hard. Have fun. Go Red Devils! It is 1:40 in the morning and I am exhausted from the emotional highs and lows of watching the Cubs win the World Series. Yeehah! Victory is sweet but the big take away for me listening to all the players and coaches being interviewed is how they all talk about their teammates and how they are there for each other. It is not about individual glory but a true team effort and I first saw this up close in the Hinsdale cross country program that my son was a part of. So for the top 7 running in Peoria, run for yourselves and your coaches and teammates and enjoy every moment of it. And for everyone on the team be so proud that you willingly chose to be a part of a very very hard sport that pushes you every day. We will be rooting for you on Saturday!!! Congratulations on qualifying again for the State meet! You are part of a proud tradition and have done the work and logged the miles to get to this day. Know that your family, friends and teammates past and present are behind you all the way. Go out today and run the race you’ve imagined. Good luck Red Devils!! By now you have read several passages from friends and family wishing good luck and providing words of wisdom. All that we ask of you is to remember when you first felt the joy of running. Remember the first time you had success running and wanted to take it to the next step… committing your time and energy. You were the pursuer, and began to rapidly pass others by. Remember that time, put it your heart and use that when you are out on the course. Seniors, this is your last race as a Red Devil. Relish this time and remember each moment. Visualize the days when you rapidly passed the others by…THIS is your day. This has not been the easiest of seasons. You know this. But greatness does not come from easy. It comes from learning how to deal with challenges, and challenges there have certainly been this season. Now it is time to put those lessons to use. Now is your moment. You are running well, running strong, and running like a team. Saturday is the perfect time to peak, and peak you will! You know Detweiler. You know your opponents. You know how well you are capable of running! You KNOW you can do this! And we know you can do this too! GO HCXC! Dear State-bound Hinsdale Central Cross Country Runners, I am looking forward to seeing this team turn in a season-best performance at Detweiller this coming Saturday. I realize this season hasn’t consistently lived up to the expectations you had for yourselves just yet, but you’ve done all the right things in terms of focus, workouts, etc. Saturday, November 5th is the day you put it all together. You guys have the talent, depth and preparation to make some noise on Saturday. Embrace the moment! You worked hard, spent time and effort to get to this point. Your endurance and hard work eventually will be rewarded. It was my pleasure to talk with a number of you this summer during your training and team-building trip to UW-Parkside. First, I want to wish you well in the state meet. Your coaches have prepared you, the tough team and individual competition in the WSC Silver has prepared you, and you have prepared yourself through hard training and self-discipline, honed to a fine edge by your dedication to the sport and to your teammates. Second, race smart. Stay within yourself and know when you should or should not make a move. It’s easy to say “Run fast!”—as many fans will urge. That’s all well and good, but in cross country place is what counts and the fast time will come if you adhere to your race plan. Third, embrace the state meet experience. This is one of those “forever moments” that will stay in your mind as a one-of-a-kind bonding experience with your teammates that will linger in your memory long after everyone has forgotten the results. And if you’re a bit awed or slightly nervous, don’t sweat it. The guy from the other team next to you on the starting line is feeling the same. 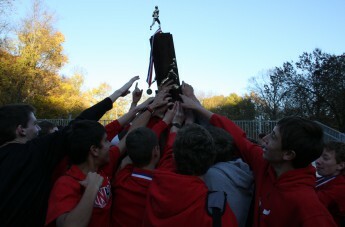 Hinsdale Central has built a terrific legacy in cross country over the last few years. Remember that you are not only running for your current coaches and current teammates but also for coaches and teams of the past—whether they ran well or not—because they all contributed, just by competing, to making the program the success and model for others that it is today. Run for future HCXC runners, too. Maybe a seventh or eighth grader who’s never run a step will be inspired by something one of you does at state and figure that he can do that as well. At the pasta dinner last week, it was evident what an honorable group of young men you are. For our family, it has been a privilege to watch you all grow both as young men and dedicated runners. These four years of sharing the cross country experience will be some of our best memories. The coaches have gotten you incredibly prepared physically. Keep in mind all the people who share the support of the Red Devils around the world. Run for them and run for your teammates. You represented yourselves very well at Regionals, which was the last KLM race for the seniors. Do the same at your last Detweiller race. I can’t wait to see you guys run to your full potential on Saturday. Good luck! The course at Midlothian Meadows has always proved challenging for us. Since 2012, its been our biennial Sectional destination, the final hurdle to clear to earn the coveted invitation to compete at the Illinois high school Cross Country championships. In 2012, we were bruised and battered by the race’s end, but did just enough to qualify for state. A week later, we bounced back with a 12th place finish, at that point, our best finish in 14 years, and in so doing laid the groundwork the following year’s state championship. In 2014 we returned as favorites only to be blasted by an emerging Sandburg group who put 5 in front of our second with a sterling 9 second split. Somehow, a week later, we turned the tables to win our second consecutive state championship. This year, we were not the favorites, but understood that so long as we stayed within ourselves, a return to Peoria would be the likely outcome. In that regard, we accomplished our mission. We were not as sharp as we could be, but neither did we fold under pressure. Our men ran composed, establishing positions by the midpoint of the race and holding steady through to the final chute. Blake Evertsen – 8th – Our lead-man since his Sophomore year, he was a bit off his game today, though that matters not one whit. What does is that he’ll be moving on to the state meet, the truest testing ground our state has to offer. Sean O’Connell – 14th – The junior had his second solid race in a row (and his second 14th place finish in a row). He is running with confidence and will make his state meet debut next weekend. Ethan Planson – 21st – The reliable senior returned to the course where he ran his varsity debut two years ago. Then, he was our 7th runner and just getting some big meet experience. Now he is a seasoned veteran who will be making his third trip to state next weekend. Neil Cumberland – 23rd – Neil had perhaps the best race of the day, moving up steadily throughout the race. He is still only discovering his potential. Jan Erik Naess – 26th – He might be the most unexpected member of the top seven based on pre-season predictions, but he has been running strong all season and especially his past three races. The affable Canadian remained poise to finish as our strong fifth man. Ryan Doorhy -33rd – Another veteran, Ryan struggled a little with the heat and mud, but gamely held on to finish in the top 35. He’s run in state for both Cross Country and Track and thus will be unfazed by the crowds of Detweiller when he toes the line next week. Sam Fathizadeh-41st – Sam burst onto the scene last year, emerging from obscurity to join the top 7. However, he’s faced considerable adversity since then, a stress fracture sidelining him for his entire junior track season. The road back has been a difficult one, but he’s fought to keep both injury and doubt at bay. He managed to push through pain today to finish as the second best 7th man in the meet. Ben Schnieders, Jacob Belgrad, Sam Schiavitti, Alec Hill, and Colin Yandel are our alternates for this year, and each has worked incredibly hard to achieve that distinction. All five will join us on what has become an annual tradition – and one we hope we can continue far into the future – of making that early November minibus drive through the cornfields of central Illinois to the cross country mecca of Peoria. On the day before the race, I had read to the competing 12 excerpts of blog posts I had written from back when they were freshmen and sophomores, alluding to the possibility they might one future day have the honor of donning the red and white to represent our team during the state series. Today, I saw junior Steven Zaher (the embodiment of a ‘team’ guy) and a large Sophomore contingent consisting of Matt Kusak, Keegan Caveney, Bradley Davis, Brandon Belgrad and Anshul Sankaran – all of whom made the drive south to cheer on their older teammates and, I hope and believe, to gain inspiration for their own personal quests to be in the elite final seven one or two years hence. The duty to inspire now falls to all of us who support HCXC. As has become our annual ritual, I am putting out a call for current team members, alumni, family, and friends to send a brief note to our squad as they prepare for next weeks’ state championships. Please address your note ‘to the men of HCXC’ and send to my email at nlawrenc@hinsdale86.org I will collect all the notes and prepare a packet to give to each of the top 12 to read on the bus ride down to Peoria on Friday. Thank you, sincerely, to all who have taken the time to read this, and to all of you who have supported us this season and beyond. I am a White Sox fan. During my first year teaching at Hinsdale Central (2005), the South Siders won their first world series since 1917, which obviously also meant the first title I’d had the pleasure of witnessing in my quarter century of life. It was a challenging time for me, as I’d recently moved back home to the Chicago suburbs after having spent the previous seven years studying and working in the pastoral fields of Iowa. Though I did have a year and a half of experience teaching, my first job had been in the tiny farm town of Lamoni, Iowa. The population of Hinsdale Central high school was literally greater than the population of that rural hamlet, and the sterling academic reputation of my new employer necessitated that I prove my worth. What is more, though I was back near the town I grew up in, most of my peers had moved away. I had not yet been around long enough at Hinsdale to have developed any close relationships, and so my first months were punctuated by periods of solitude and occasional loneliness. I became a White Sox fan because my best childhood friend, a boy named Patrick who lived down the block from me, suggested I should be. My parents weren’t much interested in professional sports, though both hailed from suburban Detroit and would have claimed the Tigers as their team of choice if pressed. Patrick’s family were huge Sox fans, though, and since I spent many afternoons playing sports in their backyard, the Pale Hose became my team of choice. Incidentally, Patrick is also the reason I became a Cross Country runner, as it was he who insisted I not quit after my first day on the middle school team. On the evening of game four of the 2005 World Series, though, Patrick was half a country away, stationed out in Maryland as a member of the Coast Guard. My other closest friends were in St. Louis, San Francisco, and Seattle. I knew I wanted to watch the potential series winner with friends, understood that it is the social aspect of Championships that renders them so memorable and fun. I called a friend still living in Elmhurst, but could not get a hold of him (this was an era just before text messaging became the norm). I called another friend, Rob, a former college teammate, and he did agree to watch the game with me, though he was not a Sox fan and thus far less invested than I was in the game’s outcome. Rob was living on the Northside of Chicago, though attending law school at University of Chicago (his girlfriend, now wife, was enrolled in a graduate program at DePaul). Of all places, I ended up meeting him at Murphy’s Bleachers, literally across the street from Wrigley Field. That is correct – I watched my White Sox win their first World Series in 88 years in the shadows of the Friendly Confines. I was reflecting on that moment last night, as I watched television footage of crowds erupting in celebration after the Cubs secured their first pennant since 1945. For the many who were not among the extremely privileged select who scored tickets to the game, the impulse seemed to be to gather in groups. Championship moments are rare in Chicago, and in the sport of baseball come sometimes literally less than once a lifetime. It was clear that for those for whom being a Cubs fan was integral to identity (a much broader swath of the Middle West, thanks to televised coverage on WGN), who understood the culture and history of the team, and who had endured decades of mediocrity punctured by moments of heartbreak, the need was there to share the victory. My social media feeds became instantly clogged with friends and acquaintances who could not contain their joy to themselves, who, by posting a message or tweeting out their emotion, sought connection with other celebrants. Thus is the power of team, whether it be one for whom you’ve been a lifelong fan, or one whom you’re a part. It is a compact to share a destiny, be it good or bad. This is something I think we all want, to feel we belong, to have others to suffer with and, perhaps more importantly, to revel with on those rare occasions when the work of months or years pays off in exactly the manner you’d envisioned in your most sincere and earnest imaginings. This is what I love so much about coaching, to know that Hinsdale Central Cross Country is a program I can become both a lifelong fan and member of, every year bringing with it its share of high emotion. What the 2016 season will ultimately bring remains as unknown as the outcome of the upcoming Cubs-Indian series. What story has been written so far though, is of a team slowly coalescing, hitting speed bumps, working through the challenge of absurdly high expectation. I will make this argument: I believe we have the best #6-10 in the state of Illinois. No trophies are given for that distinction, but I confess pride in it. Our full depth was on display at the Regional meet yesterday, where we rested three of our usual top 7, including our top two finishers from Conference, and managed to place all seven of our athletes in the top 12, separated by just 20 seconds. A trifecta of seniors led the way, with Ryan Doorhy, Ethan Planson, and Jan Erik Naess all finishing within one second of each other in 2nd, 3rd, and 4th place. Ryan and Ethan rebounded nicely from disappointing conference races, while Jan Erik made good the promise he showed in winning the JV race last week. Jan Erik Naess, Ethan Planson, and Ryan Doorhy ran a a pack and finshed within one second of each other in 2nd-4th places. Next came lanky junior Neil Cumberland in 8th, five seconds ahead of teammates Ben Schnieders and Jacob Belgrad who came across together in 9th and 10th. Both Ben and Jacob are seniors, both are passionate about the sport, and both ran lifetime best times. Sam Schiavitti finished off a strong junior campaign with a 12th place finish. He ran 15:34 at Detweiller three weeks ago and is our #10 man! While his racing is likely over for this season, we know he will be among our leaders next year. In the end, we scored 26 points to easily take the Regional title. It was our fourth regional title in a row, and the fifth in five years. We scored one point more than last year, but our 6th and 7th finished lower at Regionals than any team we’ve ever coached. After a season of frustrating races and plenty of 2nd, 3rd, and 4th place finishes it felt good to earn the win, no matter how comparatively small the field was. For the first time, all seven athletes ran solid races in what we hope portends the pattern for our remaining two competitions. And, yet, there was touch of pathos in the victory. We are now facing up closer to the reality that there are going to be some incredibly deserving athletes who do not make our top seven. They are athletes who would make the varsity of almost every other team in the state save two or three. They are athletes who have devoted tremendous time and energy in large part because their dream was to represent Hinsdale Central at the Illinois High School state Cross Country meet. It will be very tough for them and for me when they do not get the opportunity to do so. Who those athletes are is not yet clear. Next week, we’ll return a fresh and rested Blake Evertsen, Sean O’Connell, and Sam Fathizadeh to the lineup and will approach the Sectional meet with one simple goal: to advance to the Illinois State Championships and in so doing earn the right to test our mettle against the top programs in the state. Whichever seven athletes end up representing us at that meet, should we be so fortunate to get there, will have the added weight of knowing they earned a precious chance, one desperately sought by teammates whose hard work most certainly matched their own. Some guys will get to run, others, just as deserving, will not. What is most important, though, is that we will be there together. On Monday night, my daughter, born November 19, 2015, took her first steps. At first, it was 3-4 steps tentatively from me to my wife. Within an hour, she was toddling across the room. It was amazing to watch her confidence in her own abilities expand so rapidly. Once she realized she could walk, all her prior fears and doubts evaporated. That process, played out repeatedly through the human life cycle, is how we become fully ourselves. As a coach, I measure my own success based on how well I am able to help the athletes I coach reach beyond their self-imposed limits. It is, in some ways, an unfair standard to hold myself, as I control only half of the equation. Nonetheless, nothing makes me happier than to see athletes achieve a mark beyond what they’ve ever managed before, and nothing causes me hurt, frustration, and resolve so much as when an athlete performs far beneath their capabilities. As it always does, the conference meet provided me with the emotional whirlwind of highs and lows, causes to celebrate in some cases and to search for answers in others. To our Sophomore squad, I can say unequivocally and with genuine pride, you are the conference champions, and incredibly deserving of the designation. To set an ambitious goal and then strive for it, together, with every fiber of your being – and then to achieve that goal – there is truly no better feeling. my goal for cross country…that is as a team to win Sophomore Conference. One other comment I wanna add to my reflection after seeing brandon’s log is that I’m with him on that goal: win sophomore conference. I feel like the conference doesn’t even know about me. I was injured for all of xc and then I ran a 2 mile time at soph conference that I was able to do 2.5 months prior. I’m a much better athlete than some other people may think. And even more important, the conference doesn’t know about our other guys. They don’t know about keegan being a new xc guy. They don’t know about kusak’s ability to boost it. They don’t know about our insane depth of hard-working guys on top of that: we’ve got brandon, khop, fletcher, anshul, bradley, and countless others who could also shock some people next year…So yeah, I am hungry to go out and win that sophomore conference meet. There’s no doubt we have the potential to do it. You did it, boys! Your goal was audacious, having finished 4th in Conference as Freshmen. You got a huge boost when Keegan Caveney decided to join the team. Keegan finished 6th today, but his influence goes far beyond his running ability. In the week leading up to the race, he encouraged all his sophomore teammates to reflect on their seasons. Each of the three days leading up to conference, they were to write one positive note about what they did well and one honest admission of something they can improve upon, and then post it on their on-line training logs. This instruction did not come from the coaches, but grew organically, from the team up. If you want to see what a great team dynamic looks like, read the logs of that Sophomore crew. Alec Hill – 2nd place – Five feet, 85 pounds of pure fury. A true leader. The architect of this title. Matt Kusak – 3rd – Has anyone had a more consistent season? Matt was 4th at Hornet-Red, 6th at Palatine, and 5th at Naperville Twilight. Though he doesn’t show it much, few people care as much as Matt does about showing up for his teammates. He sure did that this year. Keegan Caveney – 6th – See above. His decision to join XC was a total game changer for us. His teammates (and coaches) will forever be grateful. Kevin Hopkins –10th – “KHop” – man of the hour. We needed him to come through today and he did. Finished one place better than last year. Brandon Belgrad – 11th at conference. Put in the work this year and became one of our most improved Sophomores, which was crucial to giving the team the confidence it needed. Will Ricker – 14th – Last year he was 18th and just missed all-conference. He missed much of track due to injury, but has been steadily building all season, and saved his best race for last. Fletcher Spillers – 19th – He had a rocky start to the year due to a health scare, but finished strong. For sure, ran his best race at Conference. Has great footspeed and will be a great half miler in track. Charlie Carter – 21st – Truly committed to running this year. Had an outstanding season. Like Fletcher, he has excellent speed and may excel in middle distance. Really proud of him for going ‘all in’ this year. Liam Walsh – 22nd – Great race for Liam. He is quiet and unassuming, but a hard worker. Did a great job moving up, and has tremendous potential to get even better. Anshul Sankaran – 30th – I know he is disappointed with his race, but he has learned a lot this season about dealing with adversity, and his contributions to the culture of the Sophomore squad is unquestioned. Bradley Davis – 31st – No sophomore ran more miles this summer than Bradley. He leads by example. He helped make the title happen for the Sophomores. Jack Gerami – 38th – I love his attitude. He leads his training group on EVERY run. Some kids make fun of him for it. Shame on them. You want to be great? Do what Jack does. And hear this: Jack would be in the top 7 sophomores of any other team in the conference! Josh Terry – 45th – Have him in class. Great student. Confidence is slowly building. A year of hard work, and he’ll be up with the pack. Other contributing members to the sophomore squad were Nick Sutton (57th), Matt Ostrowski (58th), Adam Bagnall (64th), Chris Deligiannis (68th), Daniel Yang (82nd), Ryan Park (83rd), Alex Colban (85th), Matt Sayre (86th), and Alan Baek (93rd). Congrats, Sophs. Savor it. Our other highlight for the day came from the JV race, which we won for the first time in my twelve year coaching career, and perhaps for the first time in school history. Our goal was to go 1-4, and we almost did. Jan Erick Naess took gold in his final conference meet, with senior teammate Ben Schnieders next through the chute. Neil Cumberland held on for third to allow us to sweep the podium spots, while Sam Schiavitti fought hard for fifth. Colin Yandel, wispy in stature but strong in fortitude, tried to push with the leaders and then paid for the fast pace, but held tight to earn the final all-conference spot in 16th. Perhaps the most surprising and impressive race of the day came from junior Kevin Ellis, who ran inspired and crossed the line in 17:11, fully three minutes faster than he ran at the Hornet-Red Devil Invitational six weeks earlier. Kevin, a junior, came out for XC this season for the first time, allegedly to stay in shape for baseball. Kevin works with Coach Kupres and Snee’s training groups, so I don’t get to see him much at practice, but have been told he is a hard work and great role model for the younger athletes. Thus, we, his coaches, were extremely gratified to see him finish his season on such a high note. I would be remiss if I did not take a moment in this blog to talk about four seniors who joined the team as freshmen and who ran their final races yesterday. I always have a special place in my heart for those guys on the team who commit to the same level as the top athletes even though they never get nearly the same level of credit. These guys, each of whom would be top 7 on many other teams in the state, never got to do that at Hinsdale Central, yet each has contributed more than they can ever know. Michael Chadwell became an Eagle Scout earlier this season, which tells you plenty about his character. A nicer guy you will seldom meet. Michael’s been running over 50 miles a week consistently since his sophomore year. He had to overcome a bout of pneumonia this past season which was a significant setback, but he always stayed positive, and ended yesterday feeling happy with his race. We’ll miss him. Nicky Midlash is one of the all-time most improved athletes we’ve ever had come through our program. He is also one of the most committed. For the second year in a row, he joined the ‘1000 mile club’ by running 1000 miles between the first day of summer running and the Conference meet. This puts him in incredibly select company (Feldman, McBrien, Irvine, Evertsen, and Scully are the only others to achieve that distinction twice). He missed his entire Sophomore track season due to chest surgery, but came to every single team meeting. That showed how devoted he is to his teammates. No one could disagree that Nicky has done everything he can to help our team. Joe Miscimarra wanted so badly to earn all-conference in the JV race. He tried his very best, moving up into the top 16 around the two mile mark, but ended 19th, just out of the medals. Just a week and a half earlier, he had the race of his life at the Naperville Twilight meet, finishing 7th in the open race. It was the first time in his life that he ever earned a medal, and to be able to hear his name announced at the awards ceremony was a special moment. Joe and Nick have been inseparable since they joined the team together as freshmen (the duo reminds me a lot of Alex Lambert and Joe Griffin, two guys from the 2014 team who were founding members of the original ‘black group’) and have helped ensure that our team remains focused and committed from top to bottom. Want to get some thoughts down about running and my career as a cross country runner. Ever since freshman year I believed I would run on a state championship winning team. I believed if I put in the work just like Josh Feldman and Emmett Scully did, I would be like them. Because of this I put in the work. I pushed myself, past my limits repeatedly, and faced the consequences. When it came time to do it again I didn’t cower back and adjust my expectations but I pushed myself just as hard, because I wanted it more than anything. I’ve been thinking about the date November 5th, 2016 for 4 years now. Through good times and mostly bad times, that date, the wild possibility of being able to hoist a 1st Place trophy with my brothers pushed me to continue to fight the good fight. And it got hard. Really really hard at points. This summer was the hardest. I even thought about quitting. I couldn’t handle another injury, another coming up short, hours and hours sitting on a bike, not knowing if it would even matter. But I kept going. Because I wanted to be on that stage more than how much it frustrated me. So today, when my chances of having that first real dream of my life of running top 7 ended, it hurt. But in reflection I would do it all over again. I think it’s important, especially for younger guys to know that I HAVE NO REGRETS WITH THE WAY I TRAINED. I always told myself I would rather be injured than average. I had a goal and went for it. I wanted to be great. I want to conclude by saying I couldn’t have gotten through these frustrations without you all. As much as my goals kept me going through tough times so did my teammates. That’s why I tried to bring some energy to you all over the past 3 weeks. I’ve never liked running, I’ve loved this team. So my cross country career does not end on a stage at Detweiller, but instead on the fields of Lyons Township, but that’s okay because this sport isn’t fair. That’s why I love this sport. It always leaves your wanting more. It will take me time to come to grips with this final blow. What I’ve been chasing for the past 4 years ended today. In that way, a new stage of my life begins tomorrow. But I’ll move on. I’ll set a new goal. And I won’t stop loving and believing in this team. For one last time as a member of the HCXC Cross Country Team, Never Stop Eatin. It may be strange to see a coach applaud an athlete for saying “I’ve never liked running” but I know exactly what JB means. I’ve run 95% of days for the last twenty years of my life. I don’t always enjoy it. I always feel better after, though. Last night, too, I thought about how much time and effort I put into cross country, how, now that I have a daughter, the time spent writing blogs and analyzing results means time away from her – how, despite all that effort, the races seldom play out the way I hope they will (and here, I grant, I am far luckier than many, having experienced the ultimate thrill available to Illinois high school XC coaches twice) and leave me wondering if it is worth it. But, in reading JB’s log, I remember why it is. What coach with a heart could read his words and not become misty-eyed? Since she learned to walk, my daughter has fallen countless times. It does not seem to discourage her. In life, we will all face many metaphorical falls. Whether we do so with the innocence of a child or with the hard earned wisdom of an adolescent transitioning to adulthood like John Bynan, what ultimately counts is our ability to get back up. That is the lesson I hope our varsity and freshman athletes will heed after this meet. It is an approach to life I hope my daughter always keeps. Yesterday was the Palatine Invitational. Chris Quick is the coach of the Palatine Boy’s Cross Country Team. He is also the author of “One Way Uphill Only,” the definitive book on Illinois High School Cross Country and someone I am privileged to consider a great friend. We first got to know each other back in 2011, shortly after his team had won their first state title and finished fifth at NXN. Hoping to learn from the best, I asked to meet with him, and he was incredibly gracious not only in accepting that request but in inviting me into his home and sharing many facets of his program with me. One of the most powerful ideas I learned from him is the notion that Cross Country is counter cultural. It is a sport where young people are challenged to act in a way that is contrary to prevailing norms. In an era of instant gratification where you can find information or order products with the click of a mouse, it demands patience and delayed gratification. In communities where we are surrounded by comfort and luxury, it asks us to not only learn to find discomfort, but to stay there. In a time and place where we are bombarded with all manner of visual and auditory stimuli, it is a sport which requires plenty of solitude and reflection. In our meeting with the team after the final race and awards ceremony yesterday, I chose to focus on this idea: of cross country in its truest form being a sort of rebellion against a culture that shields us from failure by pretending it doesn’t exist. In our sport, everyone runs the race, and the results are there for all to see. There is no hiding. We had to face up to the data: in the varsity race, we lost over 100 places from mile 1 to mile 3. In the Sophomore race, we were within a half a second of winning, but lost to New Trier on a sixth man tie-breaker. Our Freshmen ran tough in their first ever attempt at a race over 2 miles, but were not successful in their first attempt to close the gap against a very talented York class which soundly defeated us in a tri-meet this past Thursday. The JV race went a bit better, with Colin Yandel having a breakthrough performance by finishing 4th overall and six other runners (John Wheeler, Joe Glasby, Kyle Jones-Shah, Kevin Ellis, Grant Coghill, and Louis Lu) besting their PRs by over a minute; but even there, we were hampered by the absence of several athletes missing in action; each with their own reason, but ultimately adding up to an incomplete squad. -To get out more controlled. -That lots of moves early in a race can cost you later. -That even consistent training is no guarantor of a good race. One must still execute on the day. -That for those who did not race as well as we hoped, it is not for lack of effort in practice. -That our Freshmen finished 6th, the same place as last year’s group. Steven Rakos had a breakthrough race. Carter McCarroll and Mason Steere pushed themselves harder than I know they ever have before. Aaron Lu and Chinmay Amin suffered late, but only because they tested themselves early, something many runners fear to do. Will Fahy and Charlie Brubaker are now running with consistency. These freshmen need only look to the class above them to see how much can change in a year. -That though the Sophomores will only focus on the fact that they came achingly close to winning only to fall just short, that reality masks some real achievements. Charlie Carter feels awful because he was our 6th man and was behind New Trier’s 6th man, but, in fact, Charlie improved over a minute from the Hornet-Red Devil and has been showing a tenacity and focus in practice I’ve never seen in him before. Chris Deligiannis, Adam Bagnall, Peter Hughes, Matt Sayre, and Ryan Park all also improved their personal bests by over a minute. Despite the runner-up finish, I love the spirit of these Sophomores. They genuinely care about each other and it is evident that each man wants to do the best they can precisely for that reason. -That on a day we were not our best, we still finished third in one of the most competitive meets in the nation. Outside of Chris Quick’s book, my next favorite book on running is “Tradition, Class, Pride” by Jim Linhares and Ben Rosario, which is about the St. Louis University High Cross Country program. I love the philosophy Coach Linhares (now retired from coaching) brought to his program, best summed up in the title he chose for the book. Here is a team that has experienced great success and has done so the right way, valuing each individual that comes through. In their quest to race the best, SLUH travels out of state to attend Palatine. And here is the tweet SLUH wrote after the meet, on their way back south: “Varsity averages under 16:00 and 1-5 split was 37 seconds. At @PalatineXC that gets you 21st place of 32! Step in the right direction.” It should tell you something about the quality of this meet that a team as good as SLUH finished that far back. -We were the only team to finish top 6 on all levels. That is genuinely something to be proud of. It means we have the pieces in place to sustain our competitiveness, if only we are willing to continue to fight the good fight against the cultural currents pushing against us. The hardest blogs to write are after disappointing races. I do so now with certain intentions: to role model resiliency and self-reflection, to help myself and our team process our performance, and to contribute to the wider mission of promoting the sport of Cross Country by providing readers with my perspective on what unfolded this afternoon at fabled Detweiller Park during the 3A boys race. Let us begin by situating the race in time and place. It is 2016, an election year, and, not unrelated, a day before the 15th anniversary of the worst terrorist attack in American History. It is poignant to consider that I now for the first time coach athletes who were not even born when that happened. Even our seniors were then only three, and yet, now, some of them are old enough to vote. In fact, many of the miles run together by our team this season have been spent debating the merits of the candidates. It is one of the virtues of team sport that it can bring together people who politically could not be more different, which certainly is true of this year’s group. I used my precious moments in the team huddle before the race to ask each boy to take a moment for reflecting on our peculiar historical moment: to feel grateful to be healthy and strong, gifted with the opportunity to attempt to maximize the talents they’d been born with against worthy competitors and under giant blue skies. And, also, above, across, and through mud. Let us begin our discussion of place by zeroing in on the puddles of muck that had begun pooling up the day preceding, precipitation cycling through phases of drizzle and storm as we carried out our pre-meet workout. A short while earlier, as our minibus approached closer to our destination, Blake Evertsen had called up from the backseat, “Coach, how close are we to the course?” I smiled as I turned back from the front seat and replied, “Blake, this is the seventh time you’ve done this trip, don’t you know by now?” It is the ritualistic aspects of the Peoria journey that render it most meaningful. I’ve never been to this most quintessential of Midwestern cities for any other reason than to run, watch, or coach a Cross Country meet, but I’d venture I’ve done that over twenty times now in my life. Over the last several years, it’s become a twice yearly pilgrimage that now has familiar and predictable qualities like running into New Trier’s team at dinner or seeing St. Ignatius at our hotel, which is located on the banks of the Illinois River and offers the view of the occasional passing barge. There are the familiar landmarks: a pawn shop, transit station, minor league baseball stadium and convention center. There is grime and there is beauty; graffiti painted on the concrete pillars of a bridge within sight of farmers at the weekly fall market shopping their wares. I pass all these on my early morning run, a specific route I’ve charted for myself which I complete a circuit of each time we come down. There is, always, the slightly tense feeling of making the slow bus ride through the crowded back road as we wind our way to our pre-established team area which we establish in a moderately secluded shaded patch west of the course grounds. And the inevitable repinning of bibs to jerseys after meeting with officials before the race. And, too, the sense of possibility as I leave the team huddle, turning away as our boys hits their final stride before the firing of the starters’ pistol. A less comforting but no less significant aspect of the ritual is the revelation of where your team stands on that particular day. One reality of competing at Detweiller (shared by its sibling, the track at Eastern Illinois), is that one rarely leaves feeling contented. Detweiller draws the best, and so there is no hiding – you leave knowing exactly where you stand. Save a few shining exceptions, I’ve usually left feeling resolve more than satisfaction, and today’s performance was more consistent with that norm. Like last week, our final result was fair, but our effort below the standard we’d set for ourselves. What we learned: that we must tip our hat to DGN, who ran with passion and purpose, and also to Lyons Township, our other west suburban rival, who also demonstrated they are a better team than us at this point of the season. Our athletes are well aware of the times and places we’ve run here in the previous few years, of the long road ahead. To a man, we were flat, not one of our runners placing where we believed we should have. When one of ten athletes does not run well, that is mainly on the athlete. When all ten don’t run well, that is on the coaches. No single factors explains why we were not at our best, but there are several I can identify, many of which can and will be addressed at upcoming practices. The presence of two of our most distinguished alums, Zach Withall and Billy Fayette, helped put the results in a more proper perspective. Zach and Billy carpooled down together to watch the race, as Zach is in town for a short time before resuming his studies for structural engineering (he is working towards his PhD at UC-San Diego) and so was able to join Billy, who works for an insurance company in Chicago, for a trip down south which I’m sure was tinged with nostalgia. When both were seniors, we’d finished 6th at the ‘First to the Finish’ Invite (then known as the Woodruff Invite) and left feeling great. In that year, there was no talk of trophies, with the goal simply being to get to state and finish in the top half. It is perhaps unfair that all HC teams are now judged by the standard of the 2013 and 2014 teams. Zach and Billy ran simply to be the best they could. That is all any of us should aim to do. And it is by that standard only that today’s race results seemed so difficult to swallow. Listen, it’s a great group of guys. Their personalities can be told, in part, by what reading material they brought with them: “The Wall Street Journal” for Ryan Doorhy, “Harry Potter and the Deathly Hollows” for Neil Cumberland. Alec Hill brought homework assigned by his social studies teacher, Mr. Lawrence. And Sean O’Connell brought “The Great Gatsby.” One phrase from the famous final passage strikes a chord: “so we beat on, boats against the current…” But not to the past. Not us. We’ll row harder. We’ll get in sync. We’ll move forward.